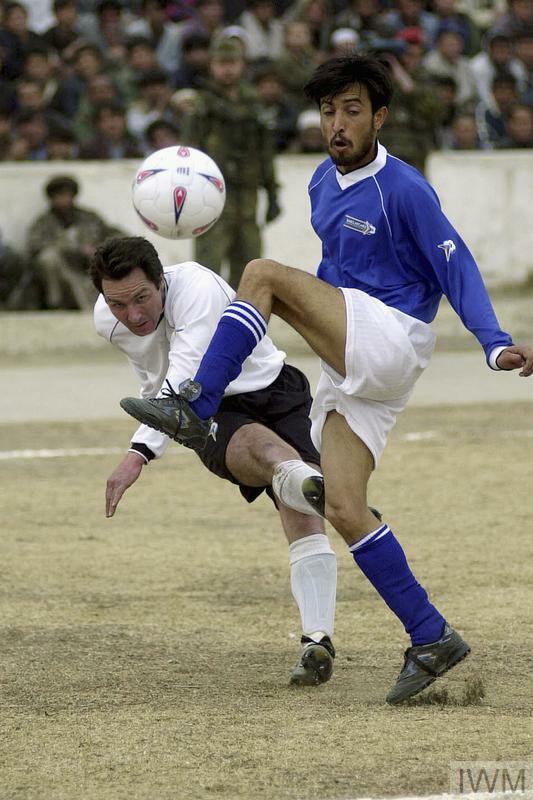 On 15 February 2002, a landmark football match took place at the Olympic Stadium in Kabul, Afghanistan. A local team, Kabul United, played members of the International Security Assistance Force (ISAF) in front of more than 30,000 spectators. The match was the first international sporting event to take place in Afghanistan in five years. 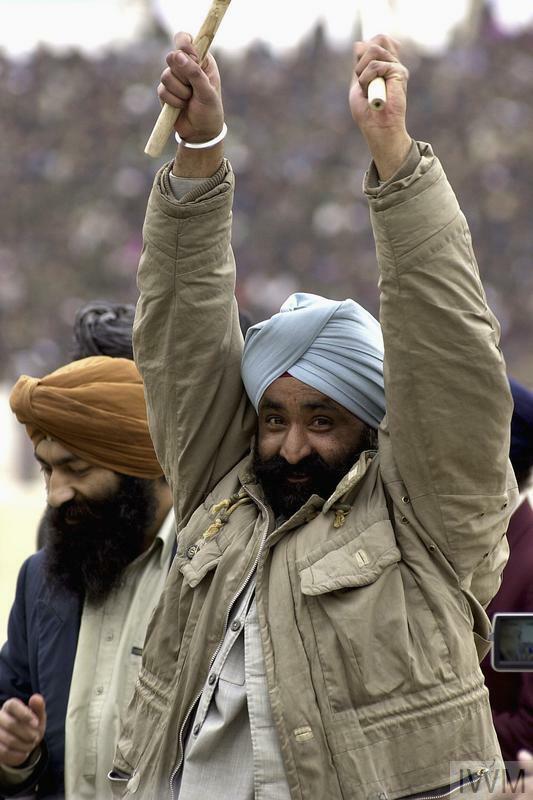 Previously, the Taliban had used the stadium for public executions, and football had been severely restricted under the regime. The event was hugely popular, and ISAF soldiers and local Afghan policemen struggled to keep large crowds of spectators in order. 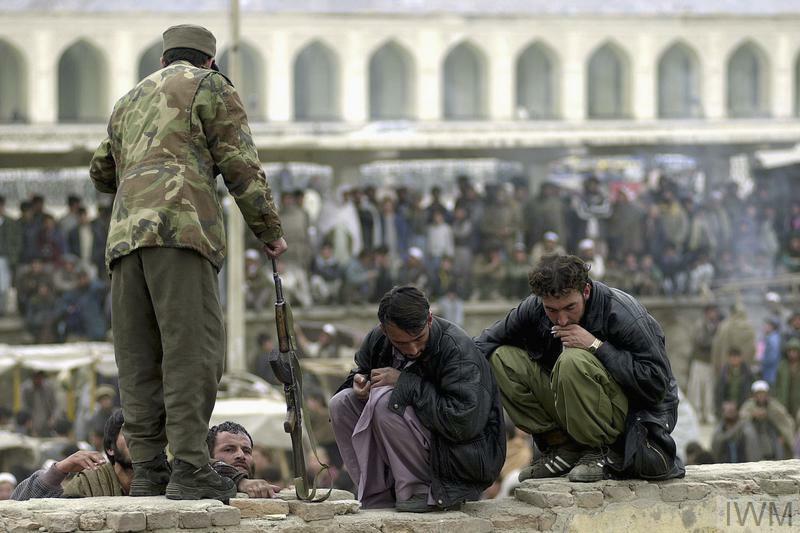 British troops were deployed in Afghanistan from 2001 under the International Security Assistance Force (ISAF). 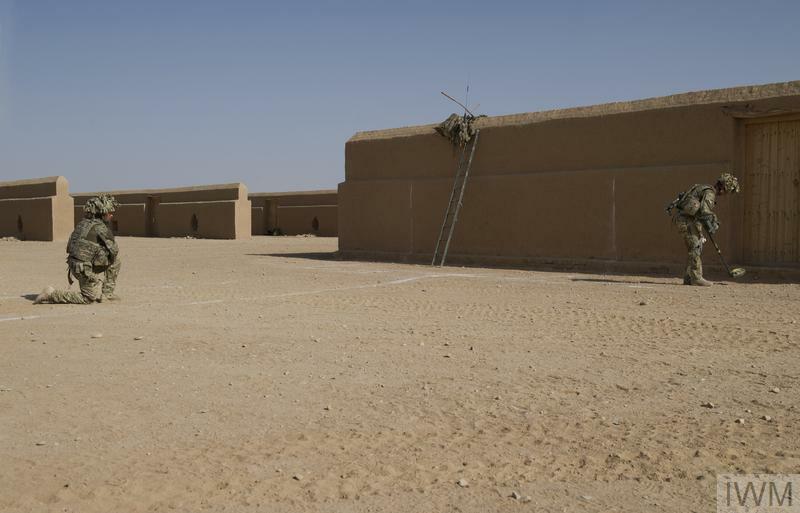 This coalition force aimed to assist a new interim administration with security and stability after the Taliban regime, which had helped to harbour al-Qaeda, was removed. However, military intervention in Afghanistan was to prove highly complex and costly and the country remained unstable. Here are 11 photos from the day the match took place. 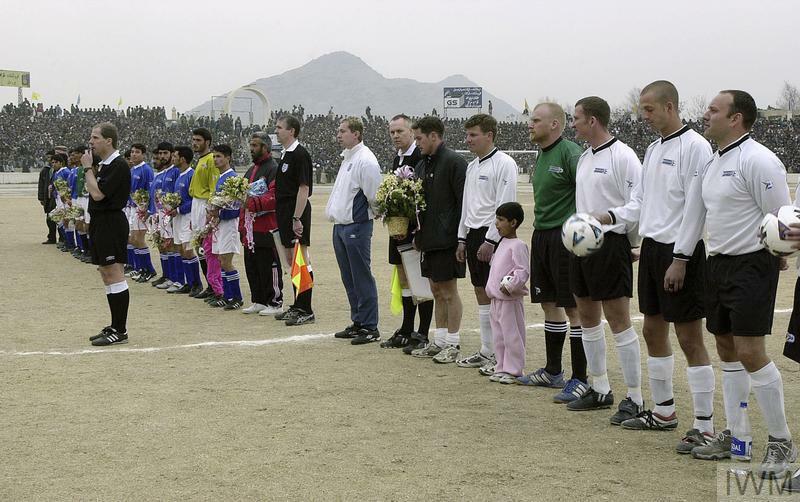 The teams from ISAF (foreground) and Kabul United line up with match officials before the start of the friendly match. Former Tottenham and England player, Gary Mabbutt, and former Northern Ireland and Southampton manager, Lawrie McMenemy, coached the teams. The official for the game was Peter Jones, who was referee at the 1999 FA Cup Final. Traditional Afghan dancers perform for spectators before the match. Three bands played for the crowds before kick-off. Music and dancing were restricted under the Taliban. 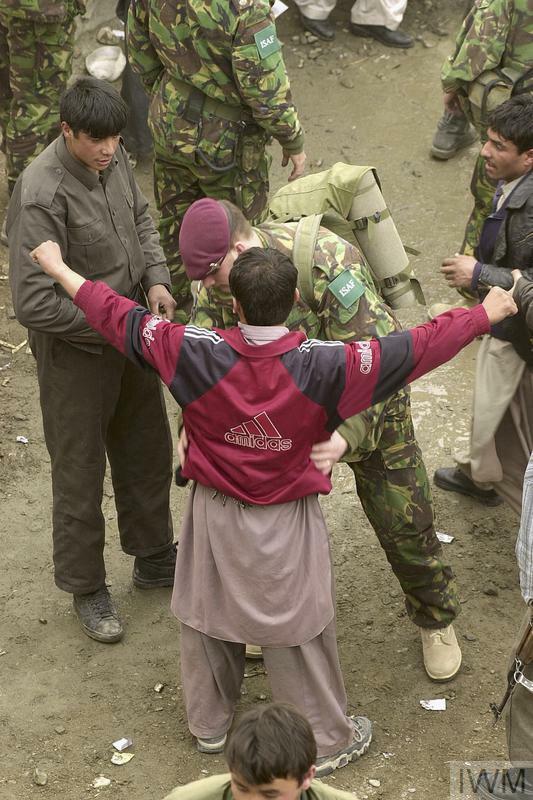 A soldier of 2nd Battalion, The Parachute Regiment searches a spectator before the match. Football was severely restricted by the Taliban. In an effort to restore normal life in Afghanistan, the match was organised by the Ministry of Defence, the Football Association and the Barclaycard Premiership. 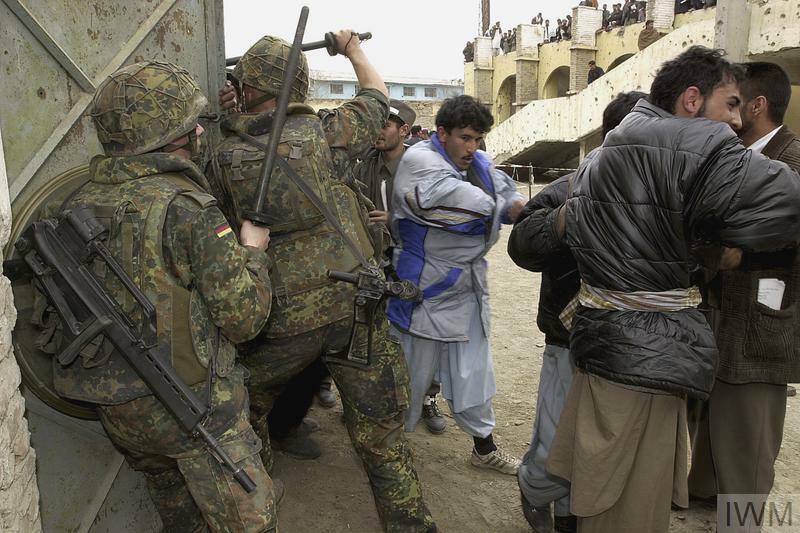 German soldiers serving with ISAF attempt to keep order as Afghan spectators pour into the stadium. Several people were injured during the crush to get into the stadium. Coach Gary Mabbutt recalled that, 'It was utter chaos outside'. Thousands of Afghan spectators pour into the stadium for the match while Austrian and British soldiers, from 2nd Battalion, The Parachute Regiment, attempt to keep order. The Afghan Olympic Stadium was the site of public stonings, hangings and executions under the Taliban. Human bones and the remains of a heel were found in the stadium when the pitch was being prepared for the match. 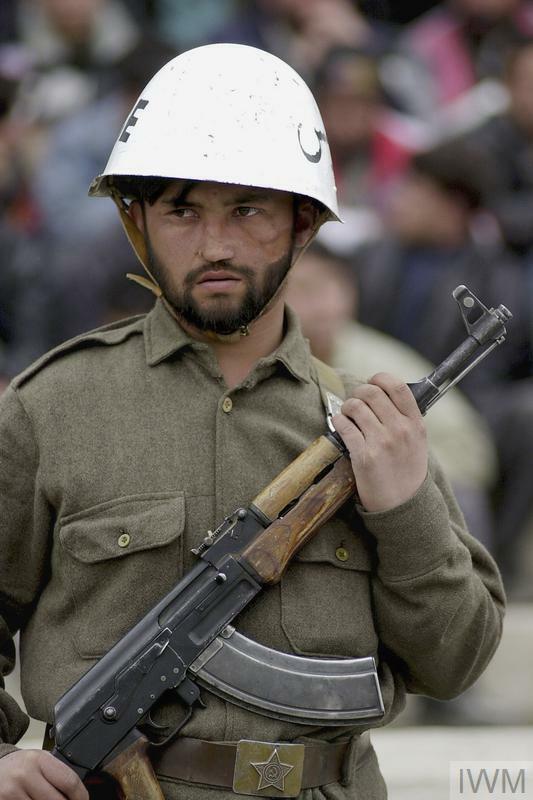 A local policeman keeps watch with an AK 47 assault rifle during the match. Police set off smoke bombs, fired their weapons and used whips and barbed wire against the rioting crowds eager to see the game. 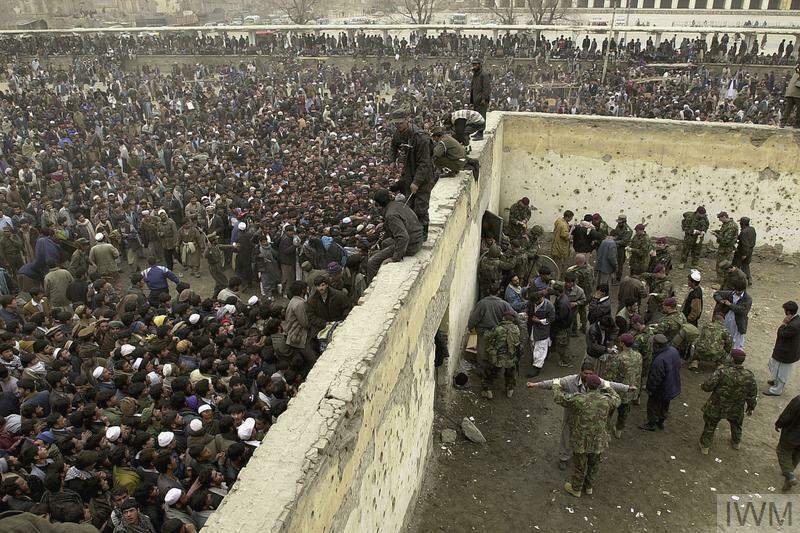 An Afghan policeman tries to prevent those without a ticket from scrambling over the wall. The match was a source of great interest to the local population, who had been without entertainment for so long. Tickets sold out in a few hours, costing the equivalent of just 7 pence. Large numbers of people without tickets turned up to the stadium and tried to gain access. Soldiers and police fought to control the crowds, at one point firing their weapons into the air. Spectators pour into the stadium, watching from every possible vantage point. 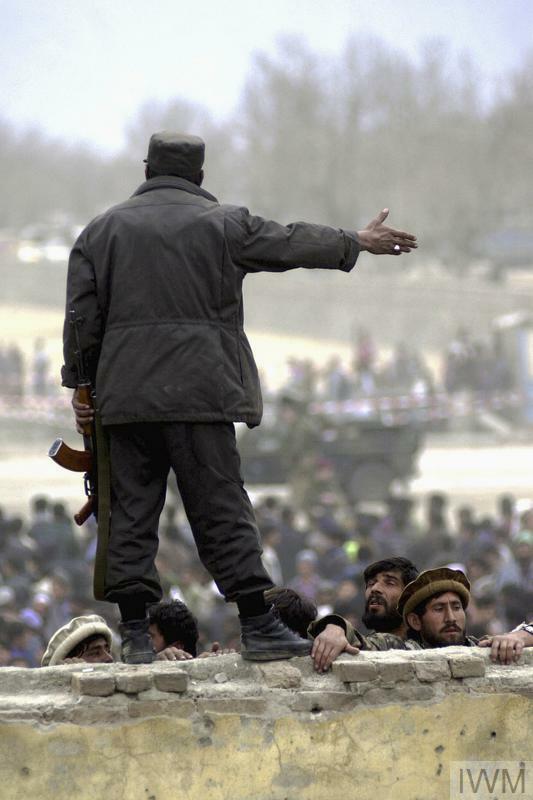 An Afghan Army soldier tries to prevent those without a ticket from scrambling over the wall. The huge crowds trying to enter the stadium caused a half-hour delay to kick-off, as police and soldiers struggled to control them. 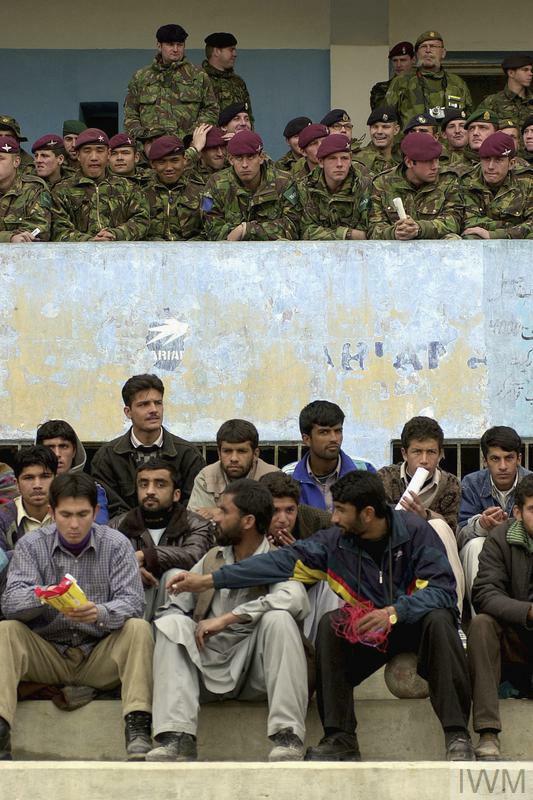 British soldiers of 2nd Battalion, The Parachute Regiment and local Afghan supporters watch the match. The ISAF team was made up of soldiers from the UK, France, Denmark, Germany, Italy, Norway and Holland. They played for the Barclaycard Premiership trophy, which was flown over specially for the event. 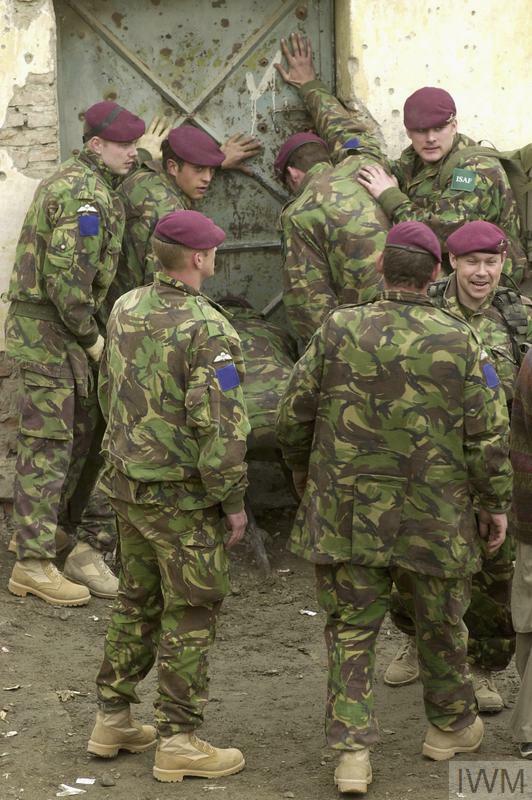 Soldiers of 2nd Battalion, The Parachute Regiment prevent gatecrashers from entering the stadium before the match. While football matches did take place under the Taliban, players had to wear beards and cover their legs, and cheering was restricted. A corporal of the Italian Army, ISAF team, levels the score. Said Taher of Kabul United scored the first goal of the match early on. ISAF scored two more goals and eventually won 3-1. The ball was signed by players from Liverpool and Manchester United football clubs. 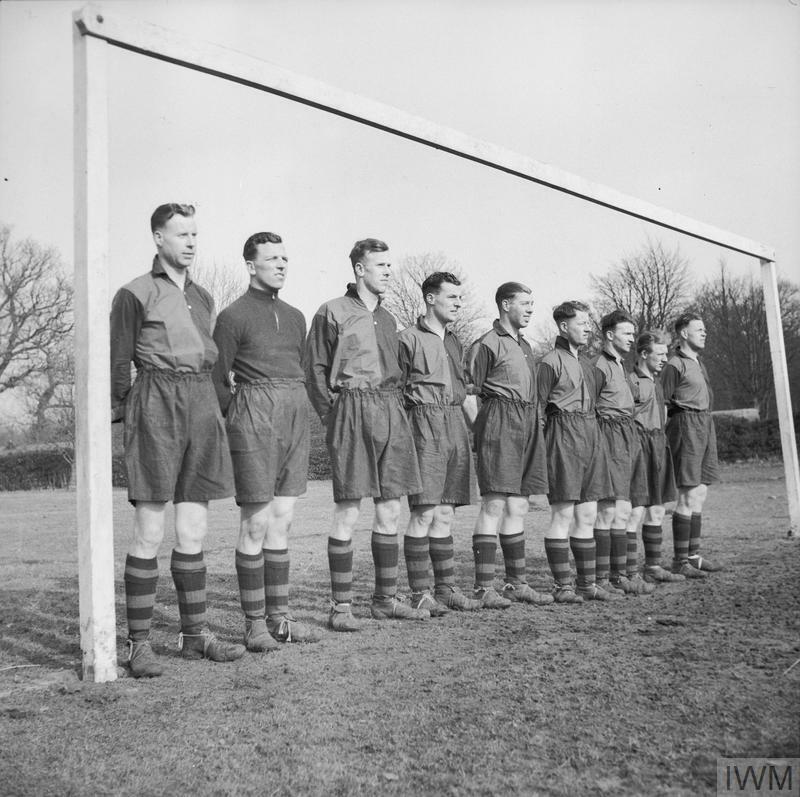 On 8 September 1939, the Football Association (FA) declared that all football except that organised by the armed forces was suspended 'until official notice to the contrary'. 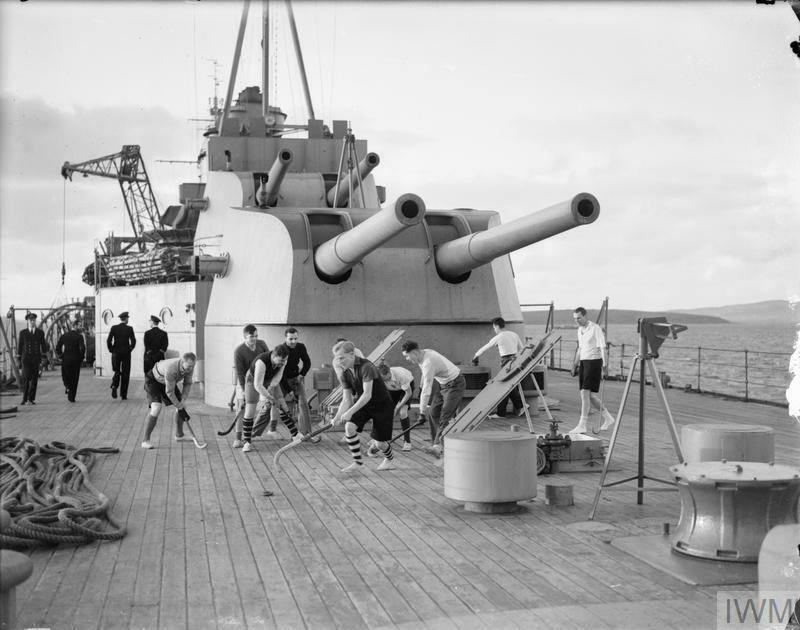 This was in contrast to 1914, when professional football had continued during the first year of war. In 1945 George Orwell wrote that serious sport was 'war minus the shooting'. He argued that sport was not a means of promoting peace between nations but was more likely to cause tensions than solve them. Three years after Orwell’s article was published, Britain hosted the Olympic Games in London. What Was the British Role in Afghanistan? In 2014, British combat troops left Afghanistan. British forces had been in the country since 2001 when they were sent as part of a coalition tasked with intervening in Afghanistan to find the leaders of al-Qaeda after the 9/11 terrorist attacks.